As I develop my small thin film processor I am often asked “What can I do with it?” The answer is a bit difficult since it is a general purpose micro-controller with Arduino like capabilities; “What can’t you do with it?”. With the approach of my nephews birthday I thought I would take the time to demonstrate one thing you might do with a small processor. I designed a paper car that can be built by my 12 year old nephew. The birthday present is ambitious in scope. 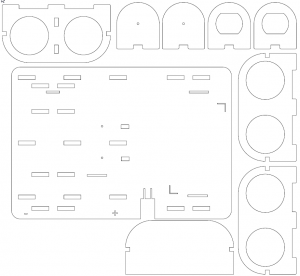 I hope to demonstrate how to design a laser cut paper car frame, how to solder and assemble a circuit and finally how to program it so that it can drive autonomously. The design is not really intended as an end point but rather it is a proof of concept and starting point for further designs. I started the mechanical design by capturing a vector art drawing of the car parts. 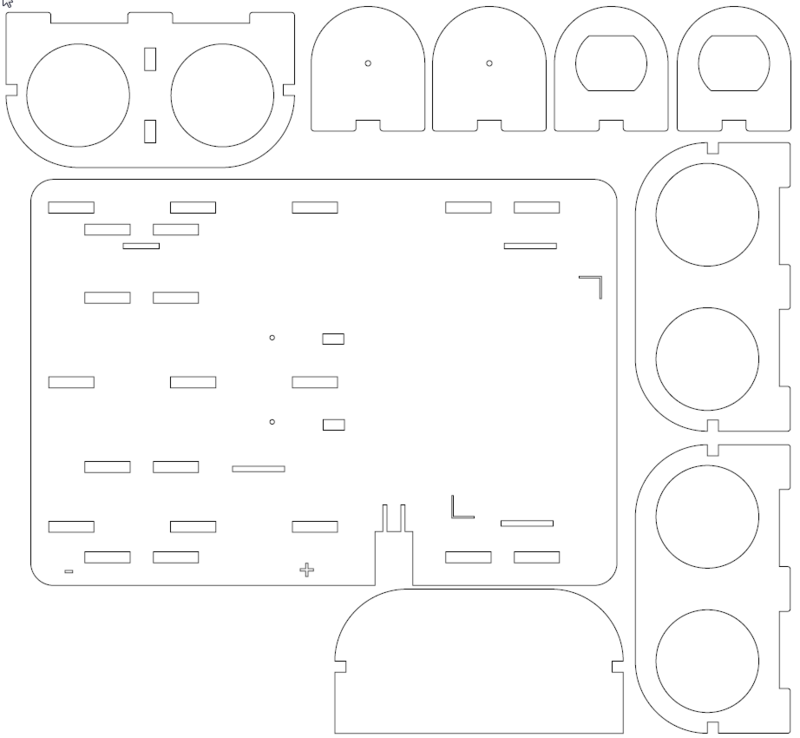 Using Inkscape I drew the car outline and slowly added details like the motor mount and battery holder. The motor dimensions were taken from the data sheet while I measured the battery with callipers. The motor holders are small sleeves that slip over the motor to hold it in position. I added small tabs that would slide into the body of the car so that everything was self aligning and rigid. The tabs were used to glue the motor assemblies into place. The battery mounts were designed to support two AA batteries. I incorporated end stops on one end to jumper the two batteries together. To keep the electrical contacts in compression I used an elastic band which is held in place by detents(dimples) in the sides of the battery holder. Without the detents the elastic tends to climb off of the battery. The design process was iterative and at certain points I would export the drawing to a bitmap file that could be imported into Eagle. Within Eagle I could design the motor schematic and layout the copper foil. The imported bitmap file was used as a template that allowed me to optimize the layout so that the foil traces were routed around the physical aspects of the paper frame. After a few tries I achieved a balance between a simple foil circuit design and the mechanical design. I then cut the mechanical frame on a Zing laser. 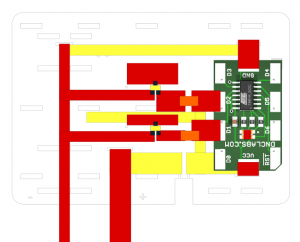 The Eagle schematic allowed me to design a wiring diagram for connecting the two pager motors to the thin film processor. 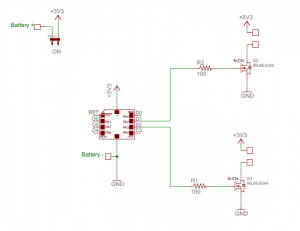 The circuit uses two FETs to turn the pager motors on and off under software control. 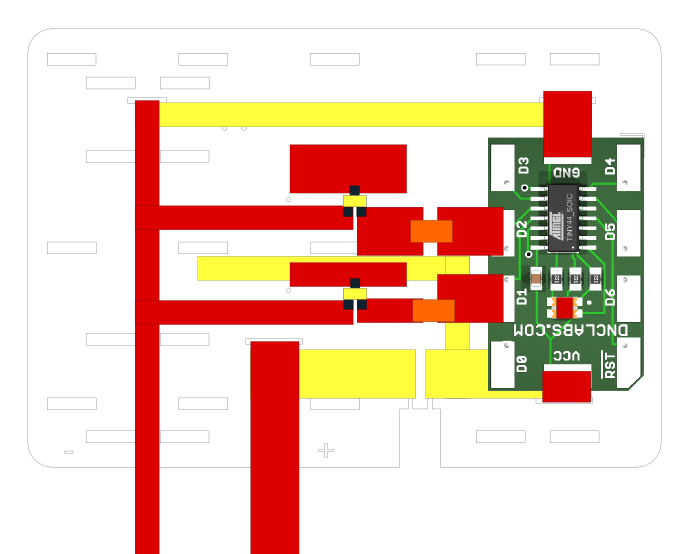 I could have designed a full H bridge but that would have used 8 transistors making the assembly a lot more complex. Once the schematic was complete I routed the board as described above. The final routing pattern was exported as a PDF file that I could import back into Inkscape. Using the Eagle routing as a scaled template I could then draw a foil version of the circuit in Inkscape. The foil circuit was used to document the assembly of the car. The car takes about an hour to assemble not including the drying time for the glue; which should be enough time to frustrate everyone. Actually I envision assembling the car in two half hour sessions. First the circuit foil is assembled and soldered. Next the bottom side motor and wheel supports are glued in place. Once the glue has dried the top side battery holder can be glued in place. Take care to add copper foil to jumper the battery end support before gluing the two halves together. I may try 5 minute epoxy as a glue next time so that the waiting times are shorter. This design is a starting point. 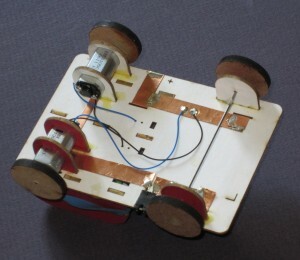 The car is programmable so an exploring mind could write all manner of code to allow the car the to accelerate and turn. 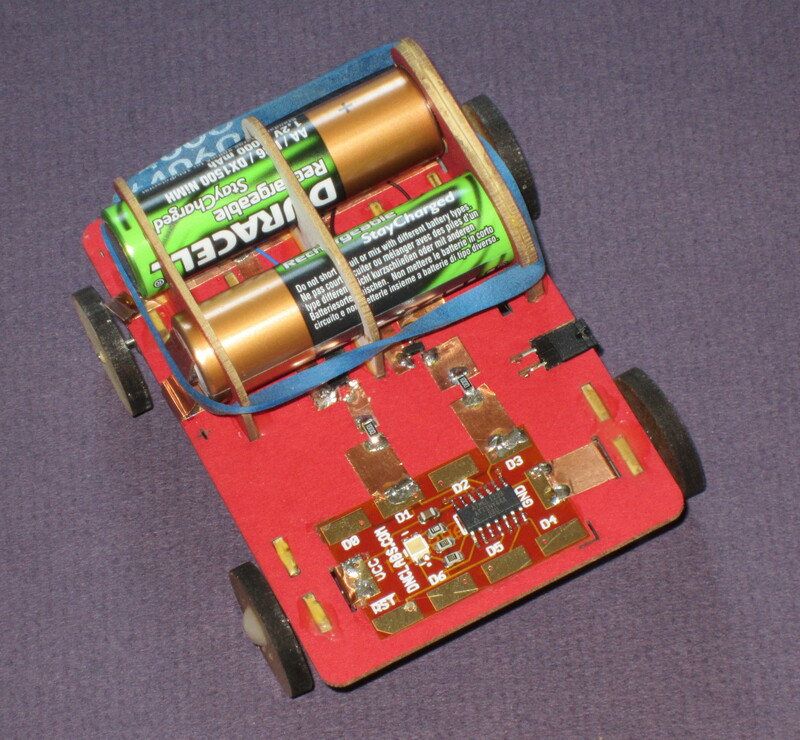 I can see adding optical sensors to create a line following robot. 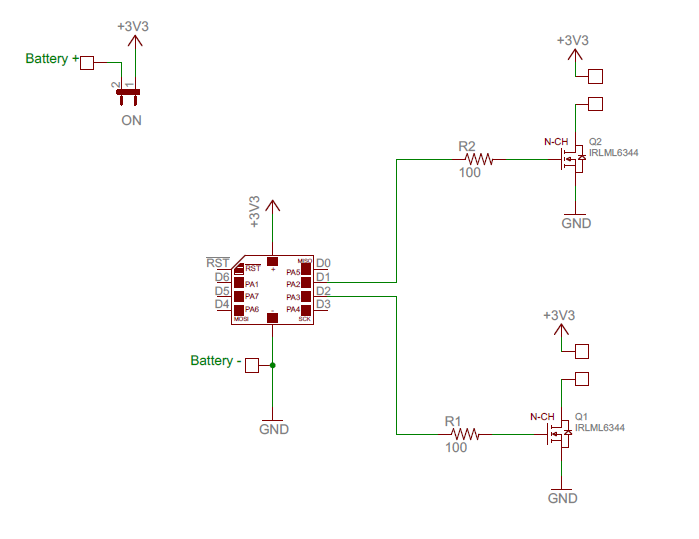 It might also be very neat if I added an IR sensor so that the car could be controlled by a TV remote control. For the school of thought that “More power!” is better; you could add two more motors to create a 4 wheel drive car. There are also several ways of creating a reversible car either by adding and H bridge or by using 4 motors where two pull forward and two pull in reverse. Of course there are also a lot of options that my nephew will direct me to and that really is the point.